Drum Corps Associates (DCA), the event producer and sanctioning body for the all-age drum corps activity in North America, this week announced that it will move its annual World Championship events to Navy-Marine Corps Memorial Stadium in Annapolis, Md. for 2012. Since its founding in 1964, this will be only the fourth state to host DCA's Championship events, which have been held in Rochester, N.Y. since 2006. 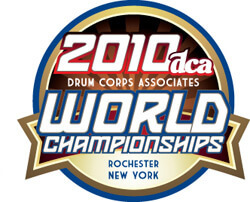 The announcement comes only days before the start of the 2010 DCA World Championships in Rochester over Labor Day Weekend from Friday, Sept. 3 through Sunday, Sept. 5. Twenty-three corps in two classes are scheduled to compete over two days at Marina Auto Stadium, home to the U.S. Soccer Federation's Rochester Rhinos. After a record fifth straight Championship title in 2009, the Reading (Pa.) Buccaneers will be looking to continue their streak against a tough field of international competition. Visit DCAcorps.org for complete DCA World Championship details and tickets. Read more about DCA's 2012 Championships in Annapolis.